Does your tank look like this and you just cannot figure out why? Well rest assured, we have answers for you. Depending on the lobster tank model you have, the foam you see in the picture above will appear on top of the water on top of your tank or underneath the tank in your reservoir base (sump). 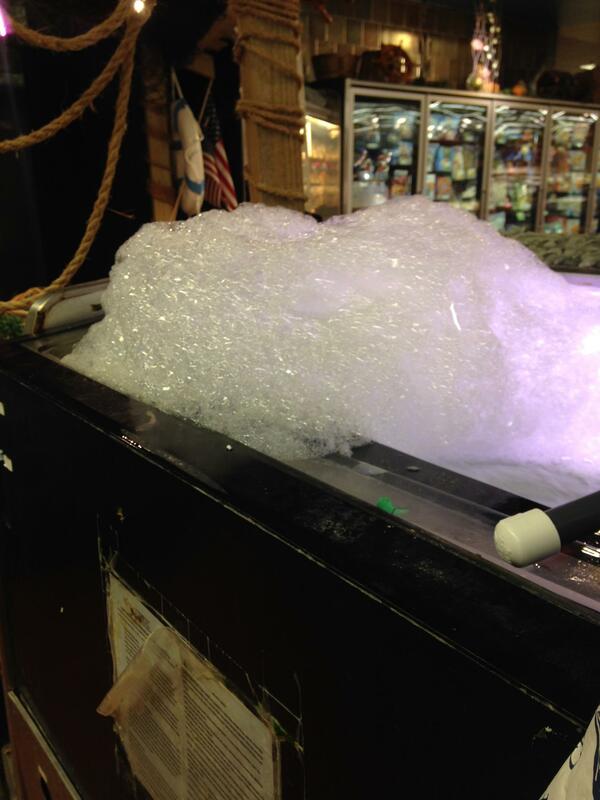 This foam is caused by an excessive amount of protein floating about the water. Such circumstances are a result of dead lobsters deteriorating and releasing the protein into the water or lobsters with broken limbs whose protein filled blood is being released into the tank water. Please note that neither the protein or the foam is toxic to the lobsters. Luckily it is fairly easy to get rid of the unwanted foam from the tank. Depending on how bad the situation, you may only need to skim the foam right off of the top of the water using a Styrofoam tray or plastic scoop. DO NOT USE ANYTHING METAL. Metals are toxic and will infect the tank water. However, if the foam seems to be a reoccurring, a simple 50% water change can be arranged with one of our highly qualified aquatic technicians in no time. To avoid future excessive protein, we suggest you perform small water changes of 10-20% as often as once a week depending on your tank load. Even when the water appears to be clear. But remember, too much of a water change can remove beneficial bacteria in your tank, rendering high ammonia levels. In addition, do not add lobsters with any visible injuries into the tank (lobster blood is clear). Inspect them closely for broken or cracked limbs. Inspect the tank daily and remove any weak, or dead lobsters immediately. Be sure to call LLS for 24/7/365 free phone support (existing customers only please) or call for emergency service. 201-398-0303, or 888- 550-SALT(7258) for guaranteed competitive rates and 24 hour response time. Stay tuned for more informational lobster tank blogs!